The English Cocker Spaniel is an easy going,intelligent and fun-loving dog,if dealt with love and care and made to feel responsible it can prove to be worthy of that trust,a sensitive,entertaining and alert dog by nature.They are keen to learn when guided properly,they take well to other dogs and family pets and are known to be affectionate and gentle by nature and friendly towards children. 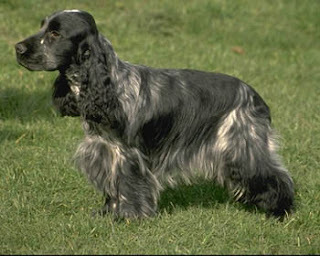 The English Cocker Spaniel has a coat that tangles and requires regular brushing and grooming,with attention paid to the hairs around ears and legs.Excess Hair should trimmed regularly and ears need to be cleaned. Its also serves well as a pleasant natured, hard working hunting dog, unperturbed by the sound of guns. Its been classed as a hard working field dog similar to the Field Spaniel and the Spinger Spinger, like its American cousin the American Cocker Spaniel it is sensitive. Health issues most common to this breed are skin problems,cataracts,benign tumors,deafness (affecting just over 6% of dogs in this breed),bite problems,and shyness.USA and Canada Health Surveys in 1998 and 2002 reported causes of death cancer 22% and old age 40% In this breed. Though UK Kennel Club in 2004 conducted a survey, it was discovered that cancer has been the cause of death in 30%, heart problems in 9% and old age 17% in this breed. In UK and USA the average life span is 11-12 years which is a good age for purebred dogs,it has the edge over its American cousin the American Cocker Spaniel by a year.